This headpiece is inspired by bright and colourful festival costumes, I love the combination of purple, pink, green, orange and turquoise, each flower is hand cut and sewn by myself, I have used recycled vintage silk and satin fabric, I have attached the five handmade roses to a black satin covered hair band. And it's backed with recycled hessian. 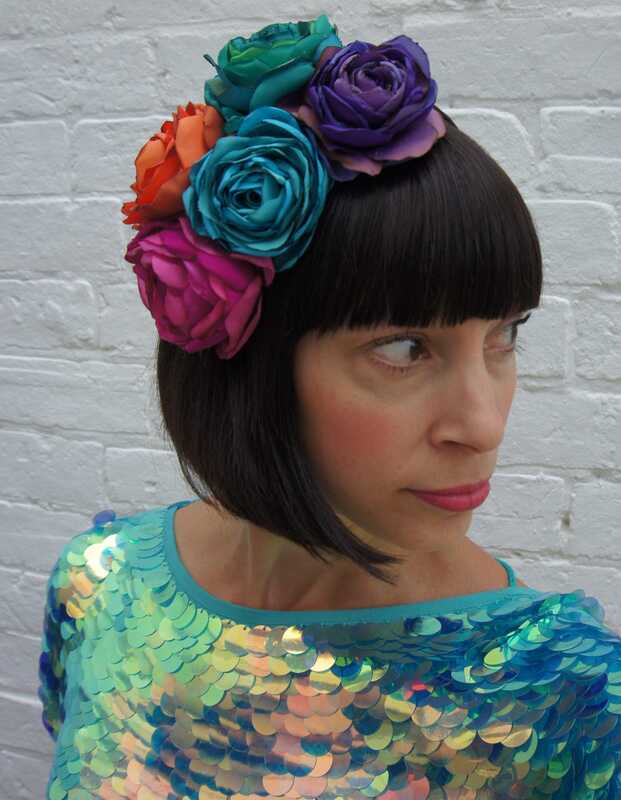 I made myself a headpiece like this last summer and wore it at the summer festivals while doing my recycled flower workshops, I had so many comments I decided to make another. It's surprisingly light to wear, you will forget your wearing it until someone stops you to tell you how amazing you look. This is a real statement piece to wear as part of an elaborate festival costume, and would be magnificent for a statement bridal headpiece, or for a wedding guest or mother of the bride, bridesmaid, or for the races or any special event.